Ontario Ombudsman Andre Marin held a press conference Tuesday afternoon to announce the release of his long-awaited report into the conduct of the Ontario Ministry of Community Safety and Correctional Services leading up to the G20 summit. The 127-page document paints a problematic picture of overblown police powers and civil rights violations. "For the citizens of Toronto the days up to and including the weekend of the G8/G20 will live in infamy as a time period where martial law was set in the city of Toronto, leading to the most massive compromise of civil liberties in Canadian history. We can never let that happen again." His report criticizes the World War II era Public Works Protection Act, which was said to give the police power to detain people five metres from the security fence. But more disconcertingly, the Act was being used to justify detentions further than five metres from the fence. Marin's report said the law "was likely unconstitutional" and infringed "on freedom of expression in ways that do not seem justifiable in a free and democratic society." The report also says that "the passage of the regulation should have been aggressively publicized, not disclosed only through obscure official information channels." Having been at most of the G20 protests in late June, I was shocked at how easily our rights were suspended. While doing nothing more than taking photos, I was questioned, detained, and harassed by the the police more than once that weekend. And I escaped arbitrary arrest several times--once simply because I moved out of the area to protect my camera from the rain. Many other innocent people weren't as lucky. 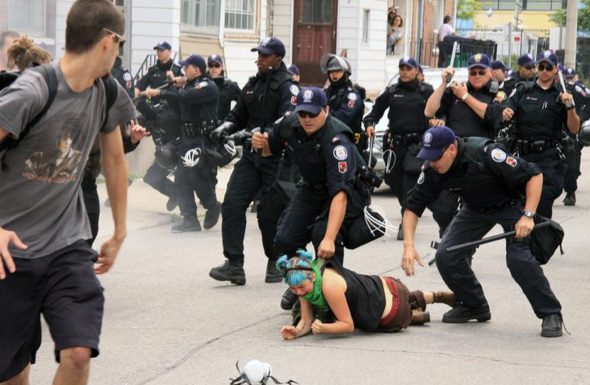 The G20 weekend proved our civil rights aren't guaranteed and can be taken away. It was a depressing and disillusioning weekend. Today's statements by Marin and his report are the first step towards making up for the injustices of that weekend. The next step, I believe, should be the resignation of Toronto police Chief Bill Blair and the minister of the Ontario Ministry of Community Safety and Correctional Services Jim Bradley. Unfortunately, the Ombudsman's report only had a mandate to examine the province's involvement in G20 security. What we really need is a broader investigation that will look at how the federal government handled the summit. The Public Works Protection Act, which is meant only for the protection of buildings but was used during the G20 for the security of summit delegates, should be revised or replaced with new legislation if authorities want to apply the law to the protection of people. The Ministry of Community Safety and Correctional Services should examine exactly what powers the police should be able to exercise under the Public Works Protection Act. "The Ministry of Community Safety and Correctional Services should develop a protocol that would call for public information campaigns when police powers are modified by subordinate legislation, particularly in protest situations." The full Ombudsman's report can be found here. Photos courtesy of the Ombudsman's office.